Adrian Day of Adrian Day Asset Management talks about gold prices, the current precious metals market and what other commodities he is following this year. He also shares his top three stocks. At this year’s Sprott Natural Resource Symposium, the Investing News Network caught up with Adrian Day of Adrian Day Asset Management. Speaking about the performance of gold in the first half of the year, Day said he really thought last year the market had turned the corner on a more sustained basis. “I have to admit I’ve been quite surprised at the lackluster performance of gold and more importantly, the lackluster, very lackluster performance of gold mining shares,” he said. But in the current market, can investors still make money? Day believes so. “In a weak market, you have to be much, much more selective as well as lucky,” he said. The expert also shared his thoughts on “peak gold,” a term he doesn’t like to use much. “If you look at what’s happened in the last 10 to 15 years really, we’ve had a very significant and virtually steady decline in ounces discovered. And so, that is going to translate into lower production going forward,” he added. In closing, Day shared his top three stocks for the rest of the year and why he likes those companies. Watch the video above or read the transcript below to learn more about Day’s thoughts on precious metals. You can also click here to view our full Sprott 2018 playlist on YouTube. INN: We’re here at the Sprott show in Vancouver. How are you finding the event so far? Adrian Day: It’s an excellent show. It really is. Given where gold is right now, the level of interest is really quite astonishing. But I think it’s a signal, most of the people here have been around the market for a while. They’re serious people, which I like. When you go to some of these shows, no names mentioned, you get retail people who come and go with the wind. People here are coming because they really want to learn and they’re really serious people. 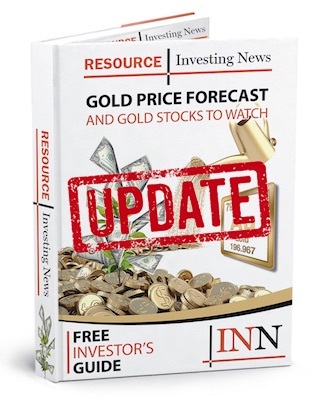 INN: And speaking specifically about gold, has the market performed as you expected at the start of the year? And what do you think will happen in the second half? AD: No, I have to admit I’ve been quite surprised at the lackluster performance of gold and more importantly, the lackluster, very lackluster performance of gold mining shares. That surprised me. I really thought last year that we had turned the corner on a more sustained basis, but clearly I was wrong on that. The fact that the stock market has sort of held up, obviously, the fact that the dollar has moved up significantly, and then also along with that, some of the economic improvement in the US I mean, these all really hurt gold. INN: There’s been a lot of talk about “peak gold,” what are your thoughts and if we are at “peak gold,” what’s next? AD: Well, I don’t like using the term “peak gold” to be honest, because people then think of “peak oil,” and peak oil had a very geologic meaning, which was we had found the most oil we ever would. With gold, it’s a little bit different. I think we have definitely had a peak, to use that word, in production for the next several years. You can tell that quite clearly by looking at the amount of ounces we discovered 10 and 15 years ago. When you correlate the number of ounces that you discover with production 10 to 15 years later, and we had a big increase in discovery in the 1990s, we had a big increase in production in the last 10 years; they correlate, obviously. I mean, it’s obvious if you don’t find this stuff, you’re not going to produce it. Then, if you look what’s happened in the last 10 years, 10 to 15 years really, we’ve had a very significant and virtually steady decline in ounces discovered. And so, that is going to translate into lower production going forward. INN: In the current state of the market, can investors still make money and what would be the best approach? AD: Yes, I think investors can still make money. Obviously, in a weak market, you have to be much, much more selective as well as lucky, but the way to make money–I mean, you look at what’s happened this year with Dalradian (TSX:DNA) being taken over, Arizona Mining (TSX:AZ) being taken over, Nevsun (TSX:NSU), the object of a takeover attempt. So, all of these. I think that’s the way to make money in this market. Then, if you look at some of the really junior companies, companies that have outstanding results do tend to go up. You look at Evrim (TSXV:EVM), for example, 20 cents at the beginning of the year. They had some incredible trenching results, just trenching not drilling. And the stock went up to $1.50. So, you can still make money in this market, but of course, for every one of those we could name 10 or 20 companies that are doing good work, but just haven’t had the sort of a spectacular success. So, you have to be a lot more selective. INN:For investors that come to this type of show, what would you say are the top three questions they should be asking a company that they like? AD: That’s a very good question. So, I’m assuming we’re talking about asking questions at juniors? AD: Because obviously, if you are talking to Franco-Nevada, you ask different questions. I’m not a geologist, so the question I want to know about the company, this is me, I want to know about the company and its plans, and its balance sheet, and things like that. Now, if you’re a Brent Cook, you ask totally different questions than I would ask because you’re a geologist, you’re interested in the geology. And I think I’m saying that because I think it’s critical that an investor understands his strengths and weaknesses. If you don’t know geology, don’t pretend you do because you’ll only suddenly make a mistake. So, what do I ask? I certainly ask about the balance sheet. I ask how much cash they have, I ask what their bond rate is, what their plans are for getting more money, what are their plans for extending the length of time until their cash runs out, and what are their plans for getting more money; those things are important. The share structure is very, very important. I like to look at what the past dilution is. In my talk at this conference, I’m going to be talking about dilution. If you’re a junior exploration company and your share count has gone up from 3 million to 97 million in five years, you’ve really got to have an incredible growth in the asset value for the shares just to stay where they are. I mean, with 3 million to 97 million, you’ve basically got to go up thirty times, the value of a company’s got to increase 30 fold for the shares just to stay where they are. So, share dilution is incredibly important to me. Then, the third thing I think going along with that is how much of your budget is general and administrative expenses (g&a), including salaries, and how much is actually going into the ground. There are companies spending 80-90 percent of their budget is just going on g&a. Well, they’re never going to get ahead. INN: This year, aside from gold, are you interested in any other commodities? AD: Well, silver, I’m not a silver bug. I don’t know if you remember we’ve talked before, I’m not a perennial silver bug, I have to say. I think gold right now has better risk-reward. So, if someone is a conservative investor and they’re concerned as much with the downside as they are with the upside, I think gold is a better play in this market. If perhaps you’re a little more aggressive or you’re more concerned with the upside than the downside, silver is just incredibly cheaper right now. And the silver companies, the good ones are just very, very, very cheap. So, I think silver will–when gold turns, but gold has to turn, silver’s not going to turn on its own, but when gold turns, I think silver will probably outperform for at least six or 12 months. I also like copper. The copper price is incredibly depressed right now. With the news out of China, the devaluation of the Yuan, you know people are getting nervous about Chinese demand for copper, but copper’s very, very cheap. But for me, the big thing about copper is the supply side, not the demand side. And the thing about copper, if it takes 10 to 15 years for a gold mine, to come in to production, from exploration to production, it can take 20, 30, 40, 50 years for a major copper mine. Some major copper mines today were discovered 50 years ago. So, the reality is that if you look ahead five or 10 years, there will be no major copper produced in five or 10 years that we don’t already know about. And the significance of that is that you can do your sums with a high degree of accuracy looking ahead for what the potential production will be. If you look ahead five years at the potential production of copper, demand only has to stay where it is for that to be a meaningful shortage of copper, which means higher prices, so I’m very bullish on copper. INN: My last question for you today, what are your top three stocks for the rest of the year and why do you like those companies? AD: Well, I like Franco-Nevada (NYSE:FNV) a lot, I always have. I think it’s probably the most conservative, well, valued of course, but is probably the most conservative of the ways to get exposure to gold. Great balance sheet, great management, and their revenue is going to double in the next two years. So, I don’t think there’s a lot of risk in that. There’s no risk in that beyond market risk. So, I like Franco-Nevada a lot. I mentioned Evrim, I still like Evrim. They had those incredible trenches result in Mexico. I was on a site visit there last month, which really crystallized my thinking when you actually see something. I mean, I think they’re doing more trenches now, they release the trench results, and then they’re going to do some drilling. A lot of drilling plan, 20,000 meters hopefully and release that some time in September. The results were very strong, you know 13 grams of 130 meters, that’s very, very strong stock. It’s just a trench, but it’s very strong. So, if they can replicate that in their drilling, I think the stock will do very, very well. I like Medgold (TSXV:MED) and we own all three of these, I should let people know. I mean, obviously, I’m not going to say I like something if we’re not the one who own it. Medgold is doing some work in exploration like in Serbia, looking for gold, not copper and it’s being funded by Fortuna Silver (NYSE:FSM), which is another company I like. So, when Fortuna Silver, which is focused on silver and the Americas said they were going to Serbia, I tackled Jorge because I’m a big shareholder, Fortuner saying what’s going on here? And he said the stock just looks so perspective that they felt it was really worth a little bit of money in time. They finish up and drill holes, all seven, hit mineralization, that’s pretty strong because normally you have at least one dud, all seven holes and now they’re doing I think about 20 holes trying to expand the project and go deeper. So, we’ll see, we’ll see what comes out, but at 35 cents, which is $10 million market cap*, I think it’s worth a gamble and it’s someone else’s money which is always nice. *Editor’s note: Medgold’s market cap is currently U$33.66 million.